Paddy from UK. Sent 2 Mar 2010. Me and my friend Storsky went to the outskirts trying to find one of the cheaper more "non local" coffee shops when we stumbled across this little treat. after walking for several hours not finding anything we spotted it and went inside, it had a very "local" atmosphere as in we were the only foreigners in there, haha. It had about 7 different types of green the most expensive was Cheese Haze at 9E per gram (I think it was the second nicest cannabis I smoked in Amsterdam). My friend got Superskunk 7E a gram, sadly the only thing they didn't have was "mega deals". It was a smallish coffee shop but it had a TV, arcade machine and toilet. The music hiphop/rap. The guy at the counter was very friendly he let me know where the Kashmir Lounge was (only 3 doors up, we walked past it) I would definitely go there again if I was in the area. 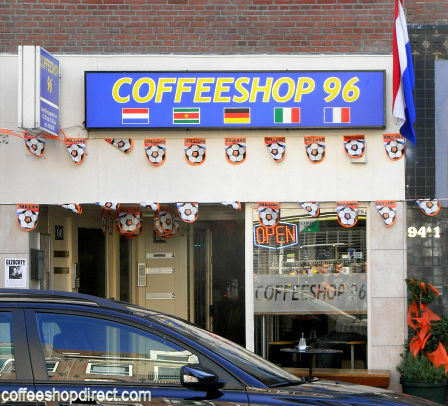 There is no topic for Coffeeshop 96 in the ACD Forum yet.